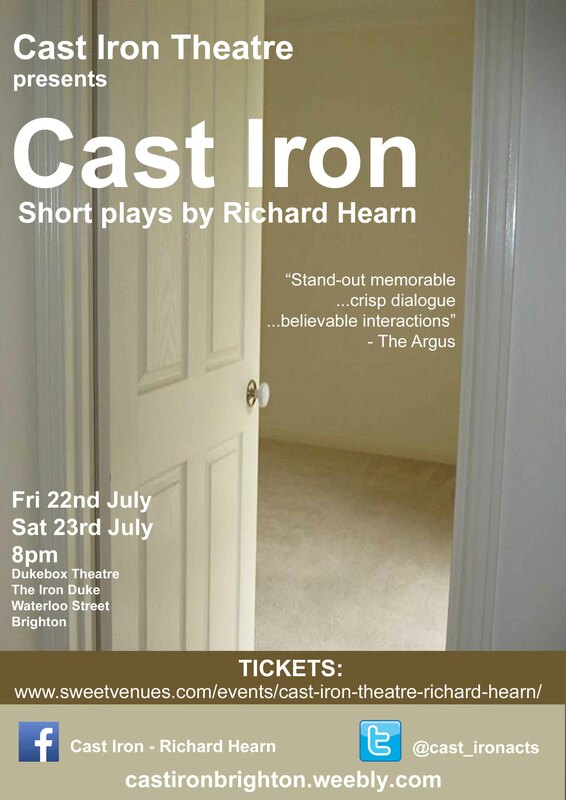 On July 22nd and 23rd, 6 of my short plays will be performed by Cast Iron Theatre at the Dukebox Theatre in Waterloo Street, Brighton. Tickets and Facebook page here. The night will feature 4 plays which have been performed before and 2 new ones. Without wanting to give too much away, there’s at least one murder, there’s manipulation, there’s romance (of a sort), a time machine, ducks also feature, a wedding, some facts about space, some facts about estate agency, Margaret Thatcher, and an occasional table. Something for everyone, I think you'll agree. I’ve been extremely grateful that my plays have been accepted by Cast Iron Theatre, led by Andrew Allen, who are an acting, writing, and directive collective but embrace people who do just one of the three. As someone who can't direct, can't act, can't even dance a little, and my skateboarding is rubbish (Copyright Fred Astaire, sort of) I would say - as a writer only - what a fantastic opportunity it is. My recent writing has been all about short plays. Previously I’ve written unpublished novels, published articles (for The Artist, Camping Magazine, Prima Baby & more) and written parenting columns ('Dadsense' for, er, Mumsense Magazine, and 'Distracted Dad' for Brighton’s Latest Homes). Then, back in 2012, I had a piece called ‘King Alfred’s Museum Tour’ win a place as a rehearsed reading for a Brighton Fringe night at the New Venture Theatre. Hearing my own work read aloud by actors - with its sharp similarities to what I intended, and, yes, its interesting differences too - gave me the bug. I loved it. People laughed at the bits they should. The actors were tremendous. Writing for Cast Iron has been the same positive experience. I can’t talk for other writers, but for mine, they’ve got it; they’ve often improved on it. The performances and direction has brought the plays alive and - probably, I’m no expert - ironed out all the issues and invented ways of making it work. For me - in my nervous, lager-gripping state, when I watch the play for the first time - what I have imagined is up there on the stage. They’ve made it work. They’ve brought my stories alive. My intention is to write another blog, where I talk about the writing of each play (without any spoilers, of course), but in the meantime, join the facebook page here and buy tickets here. And if you can’t come, I’ll forgive you. But if you can retweet/like/share any posts, that would be good. It’s the way this modern technology works.